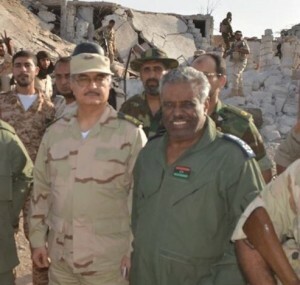 The head of the Libyan National Army’s air force Major-General Saqr Geroushi is repiorted to have suffered a heart attack and be in intensive care in Marj hospital. Following rumours early this evening that he had died, the Libya Herald contacted colleagues of his son, House of Representatives member Tarek Geroushi. They stated that the major-general had suffered a heart attack. He had not died, however, but was in hospital. Geroushi, who has been one of Hafter’s righthand men ever since the launch of Operation Dignity in May 2014, has been suffering with a heart condition for some time. He was in Jordan for part of 2016 being treated and returned to Libya only late last year.